Professor César Mejía holds a Master in Management from EADA, Spain, and an undergraduate degree in Industrial Engineering from Universidad Industrial de Santander, Spain. Professor César Mejía has been a Consultant to Expomobi Halcor Telecom, Lincoln Electric Company Europe and Waterchem Holding. He has been Project Manager at ITT Automotive and Manufacturing Manager at Dana Holding Corporation. 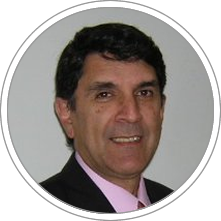 After working 14 years in multinational companies, he became a professor of operations management courses and continued providing consultancy services in Spain and Latin America, where he is a visiting professor at several business schools. He has been a professor at INALDE, in Colombia, Prague International Business School, and Barna Business School in Dominican Republic. In the last years, he has been training professors in the case study method. Mejía, C. (2007). La dirección de empresas y el sentido común. 50 Lecciones de Management: libro conmemorativo del 50 aniversario de EADA. GRANICA. He currently is the General Manager and Consultant at CYM Consulting, Head of the Programs Department, Professor at EADA, and Visiting Professor at CENTRUM Católica Graduate Business School.